The One Sample Strategy is a voluntary public-private partnership that extends the benefits and responsibilities of official testing to commercial grain operations, including grain elevators, feed mills and commercial laboratories. All Texas grain operators are invited to create a customized Sampling and Testing plan based on the Grain Inspection, Packers and Stockyards (GIPSA) official methods described in the One Sample Strategy handbook. 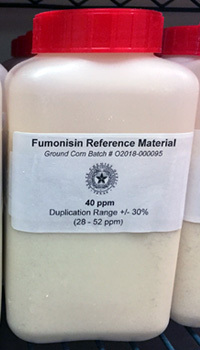 Naturally contaminated corn is used to produce reference material. As an approved ISO 17034-2016 Reference Material Provider, the Office of the Texas State Chemist provides free aflatoxin and fumonisin reference material to all One Sample Strategy participants. Reference material is developed from naturally contaminated corn and is produced according to the ISO 17034:2016 standard in order to establish the target mycotoxin concentration, confirm product homogeneity and determine stability. One Sample Strategy analysts analyze aflatoxin and/or fumonisin reference material (i.e., control samples) to evaluate the reliability of the testing system and correct problems before testing official samples. OTSC field staff regularly visit approved labs to monitor results, check records and collect file samples for verification testing. File samples are analyzed by the OTSC’s Agricultural Analytical Service using high performance liquid chromatography (HPLC) for aflatoxin testing, and Ultra‐high Performance Liquid Chromatography with a Tandem Mass Spectrometry Detector (LC/MS/MS) for fumonisin. The OTSC Quality Assurance Manager reviews control sample records and verification results, and works with One Sample Strategy labs to improve performance. Firms use approved equipment to perform the primary program activities: sampling, grinding and aflatoxin analysis. Firms assign two or more employees to perform activities. To become credentialed as an OTSC designee approved to issue official mycotoxin results, employees demonstrate their ability to sample, grind and test corn for aflatoxin and/or fumonisin using USDA-approved methods. Employees use a 6’ spiral hand probe and follow USDA representative sampling patterns to collect a 5 pound (minimum) sample from each incoming truckload of corn. Each sample is ground in a Romer mill until at least 70% of the particles pass through a 20 mesh sieve. Firms use testing methods approved by USDA and validated by OTSC to measure aflatoxin above 100 ppb and fumonisin up to 100 ppm to ensure accurate, defensible and timely results. A Certificate of Analysis is issued for each sample. Equipment maintenance and employee proficiency records are also kept by the firm. OTSC field investigators visit participating firms on a weekly basis to review records and observe employee performance.